After the terrorist attacks of September 11, 2001, Congress mandated the Centers for Disease Control and Prevention (CDC)’s BioSense Program to aid in the early detection and assessment of bioterrorism-related illness. Through a central CDC-hosted environment, the current BioSense system integrates information gained from Department of Veterans Affairs and Department of Defense facilities, various local and state health department surveillance systems, and emergency departments (ED) data feeds from several civilian facilities around the US. Because BioSense receives this information prior to the final diagnosis of a patient’s health condition, it provides near real-time monitoring of population health, often referred to as syndromic surveillance. Typically, public health practitioners analyze and interpret these pre-diagnostic data and share their findings with community partners in disease prevention and control. Although it provides an important service, the initial BioSense information system was developed and implemented with limited involvement from public health and preparedness stakeholders. As a result, states and localities have adopted the program or found it to be acceptable for their needs only on a limited basis. User demands for higher quality and more representative and locally useful data have spurred CDC, in collaboration with key partners, to develop an updated vision for the program. This new direction moves BioSense beyond its original purpose of bioterrorism-related surveillance to an all-hazards approach by supporting state and local jurisdictions to conduct and sustain syndromic surveillance efforts.1,2 Furthermore, by facilitating interactions among and between a range of public health experts, and integrating more representative local- and state-level data into a cohesive picture, BioSense improves its utility for all users. The redesigned program, known as BioSense 2.0, is a community-controlled environment architecturally distributed in a cloud computing model. The Association of State and Territorial Health Officials (ASTHO) is hosting the cloud environment and facilitating the governance of BioSense 2.0 by state and local health jurisdictions, in coordination with the Council of State and Territorial Epidemiologists (CSTE), National Association of County and City Health Officials (NACCHO), and International Society for Disease Surveillance (ISDS). BioSense 2.0 is consistent with the 2006 Pandemic All Hazards Preparedness Act and 2007 Homeland Security Presidential Directive. Both call for regional and nationwide public health situation awareness through an interoperable network of systems, built on existing state and local situation awareness capability. Through the BioSense Program, CDC provides funding directly to support state and local health departments, public health associations, and academic institutions for syndromic and other public health surveillance efforts to sustain a new public health surveillance model of shared responsibility and governance. BioSense 2.0 offers an unprecedented opportunity for collaboration among the scientific, clinical, and public health practice communities built around real interchanges of information. From the start of the project, the BioSense redesign collaboration site has encouraged transparent information interchange among stakeholders regarding the building of the new system. When BioSense 2.0 launches, authorized users and developers can use the open collaborative platform to quickly develop, test, implement, and validate new ideas for using data to effectively respond to emerging health events and population health improvement. The BioSense Program is looking for successful examples of how to quickly move science into practice by crowdsourcing continuing innovation through a problem-solving challenge model. BioSense 2.0 will offer members of the scientific, clinical, and public health communities opportunities to develop and improve new data models and algorithms. For example, the BioSense 2.0 user community will be able to test and validate aberration-detection algorithms and choose whether an analytic approach is successful by adopting it into their practices—or not. Ultimately, the success of BioSense 2.0 depends on the users and their trust in the system. The shared space in BioSense 2.0 makes it a unique public health information environment. By using shared de-identified data from multiple jurisdictions (shared per fully executed data-use agreements), state and local health departments can stitch together regional and national pictures routinely or during events. Users can create views and set alert thresholds to look at only the particular information that is of interest or utility to them. These views can represent analyses of the same outcomes on an ongoing basis for constant surveillance or ad hoc queries for special events, such as regional disasters (e.g., hurricanes, wildfires) or national events (e.g., pandemics, sporting events). In BioSense 2.0, state and local jurisdictions can perform analyses and surveillance, empowering them to improve public health practice and the health of their own communities. They can also obtain regional views and enhance their understanding of the epidemiology of diseases in neighboring regions. The distributed model allows users to own their piece of the environment. 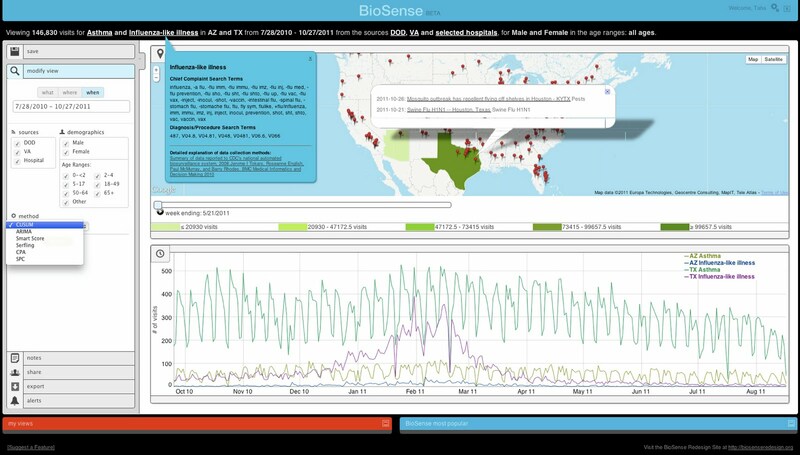 BioSense 2.0 offers a web-based interface for the shared space that gives authorized users access to easily modifiable data visualizations and basic statistical analyses. Image from a BioSense 2.0 prototype of the shared space that shows the system’s ability to provide authorized users with features allowing them to share information through social controls, easily modifiable data visualizations, and basic statistical analyses. This image does not reflect a real event. Click to enlarge. BioSense 2.0 also incorporates complementary informal situation-awareness information from the HealthMap system (shown as red pins on the map). HealthMap is an event-based surveillance system that uses unofficial reports of disease—e.g., from clinicians or web-based health-related news media—to track outbreaks.5,6 Such systems have proven reliable and timely; the 2005 revision of the International Health Regulations recognized the value of informal information sources to epidemic intelligence.7,8 BioSense incorporates this HealthMap information as an epidemic intelligence layer that is available to users and can be correlated with healthcare-related ED syndromic information. The BioSense redesign team also worked with Google Correlate to explore and visualize trends in BioSense ED-based chief complaint or initial diagnosis data. Examples correlating BioSense ED-based initial diagnosis trends against normalized Google search patterns are available here. This methodology supports Google’s Flu Trends, shown to correlate with CDC’s Influenza Sentinel Provider Surveillance Network surveillance data. High correlations between BioSense ED-based initial diagnosis trends against normalized Google search patterns were observed for upper respiratory infection (represented as ICD-9-CM code 465.9), external ear infection (ICD-9-CM 380.10), diarrhea (ICD-9-CM 787.91), nosebleed (ICD-9-CM 784.7), and chronic bronchitis exacerbation (ICD-9-CM 491.21). Further work is required to determine how this innovative approach can be applied to enhance syndromic surveillance practice. However, this collaboration illustrates CDC’s openness to consider new surveillance approaches to respond to the changing information environment. There are many benefits to BioSense’s new direction. For example, the user-centered approach taken in the BioSense redesign process will continue under the governance group, allowing BioSense 2.0 to be iteratively updated based on user feedback and emerging needs. In addition, because BioSense 2.0 offers shared infrastructure, analytic tools, processes, and methods cost effectively, it allows health departments and other users to focus their surveillance resources on the people performing the analysis and collaboration and away from outdated technical systems. This shift lets a health department make better decisions and inform clinicians about a community’s health status. On the basis of user and expert feedback, we conclude that the best means of syndromic surveillance and situation awareness is people actively reviewing data and working collaboratively across county, city, state, and regional lines to create a bigger, more accurate picture of the nation’s health. In working with ASTHO, CSTE, NACCHO, ISDS, and other academic and professional organizations, CDC continues to respond routinely to stakeholder requirements and build the health monitoring infrastructure and human capacity needed to ensure rapid and enhanced interchange of timely information. CDC and its partners hope to link public health and healthcare communities through BioSense 2.0 so that public health practitioners can make sound judgments about the health status of the public. Kass-Hout TA. BioSense Program: Going Forward. Eighth Annual International Society for Disease Surveillance (ISDS) Conference, Miami FL, 2009. Kass-Hout TA, et al. BioSense Program Redesign. Ninth Annual International Society for Disease Surveillance (ISDS) Conference, Park City UT, 2010. Regulation for the Medicare and Medicaid EHR Incentive Programs and “Meaningful Use,” Center for Medicare and Medicaid Services (CMS). CDC and ISDS Meaningful Use Recommendation for Syndromic Surveillance, U.S Centers for Disease Control and Prevention, 2011. Brownstein JS, Freifeld CC, Madoff LC. Digital disease detection–harnessing the Web for public health surveillance. N Engl J Med 2009;360:2153–7. Brownstein JS, Freifeld CC, Reis BY, Mandl KD. Surveillance Sans Frontieres: Internet-based emerging infectious disease intelligence and the HealthMap project. PLoS Med 2008;5:e151. doi:10.1371/journal.pmed.0050151. Chan EH, Brewer TF, Madoff LC, et al. Global capacity for emerging infectious disease detection. Proc Natl Acad Sci USA 2010;107:21701–6. Fidler DP, Gostin LO. The new International Health Regulations: an historic development for international law and public health. J Law Med Ethics 2006;34:85–94.